The 2015 Paper Source Colorscope is HERE! Identifying your Paper Source Colorscope sign is easy, especially with our newest Paper Source color, Antique Gold. Our hues are here to provide your creative side with more ways to express yourself through color. Go ahead, find your two favorite Paper Source colors, check out our Colorscope readings, and tell us what you discover! It’s wedding season and we’re getting inspired by our original Wedding Invitations designs. 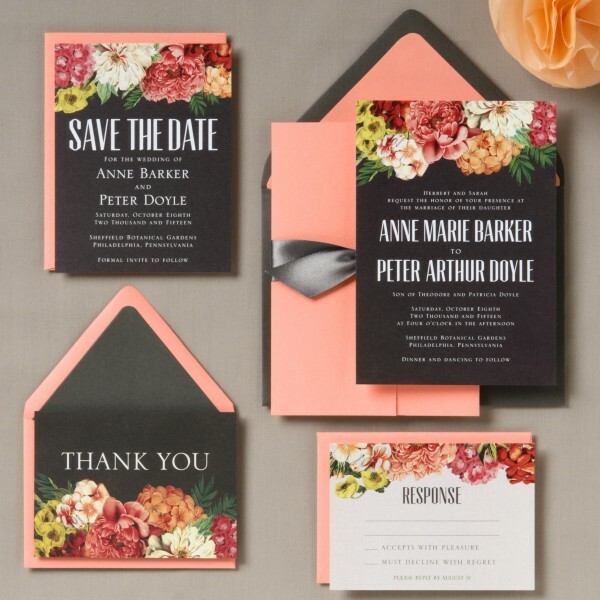 Even if the wedding bells aren’t in your future, you can still swoon over these amazing invites. Paper Source offers over 90 exclusive wedding suites, all designed in-house by our team in Chicago. Our designers create a variety of invitations for every taste (from classic to contemporary), all while incorporating their own unique style. To get a better sense of their inspiration (as well as insight into our tastemakers’ design range), we asked four of our designers to pick a favorite that they’ve designed, and their picks are below. My favorite is the Vintage Floral suite. I love the vintage feel, but at the same time it’s crisp and modern. Vintage floral, engraved-style illustration is always going to be my favorite, and it will never feel dated or trendy. The inspiration behind this suite is old letterpress and engraved illustrations of botanicals. This look can be styled in a variety of ways – pair with all white and hits of black for a simple, clean and elegant look. Or pair it with Luxe Blush for a soft, romantic feel. Or it could be paired with more casual components like Paper Bag. My favorite suite is the Bouquet suite. I think this invitation suite is one of the most energetic and graphic suites in our current line. The inspiration behind this suite was vintage floral illustrations from encyclopedias and garden manuals. It is unique enough to stand out, but general enough to complement any garden wedding – and the typography makes it modern and sophisticated. It also pairs well with bright, fun colors. My favorite is the Foil Stamped Laurel Branches. First, I love the play of the clean, modern font used for the bride and groom’s name, paired with the ancient and elegant laurel wreath. Although this suite was inspired by some traditional elements, I love that they all suddenly feel updated with a small twist of a modern font and fresh color. I really enjoy the color pairing as shown – rose gold foil with white paper and a blush envelope. This suite would also be beautiful in white and gold, or cream and rose gold. 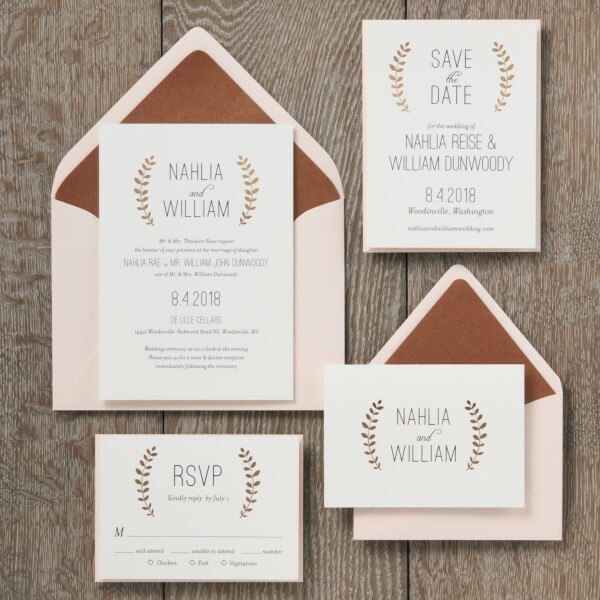 I think the Foil Stamped Confetti Wedding Invitation is elegant and classic, but modern at the same time, and could work for a variety of wedding styles. 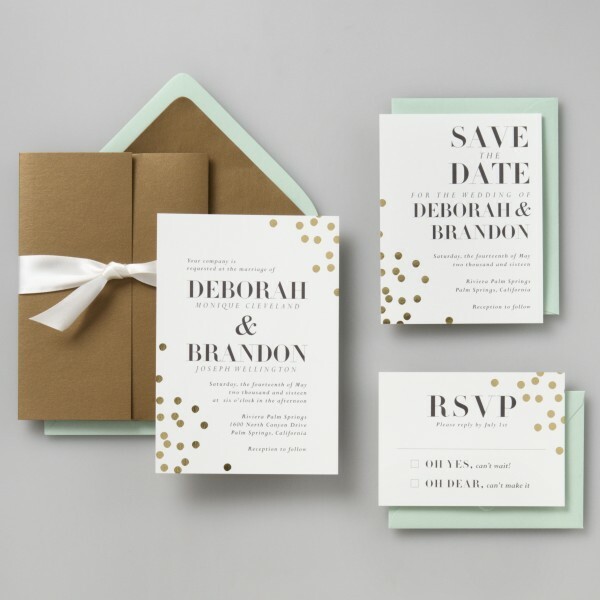 I like the gold foil confetti dots because they are subtle and give the invitation a special touch, and it comes in other foil color options! I also like how the names are big, it’s the first thing I notice when I see the invitation. I love the way the suite is shown, with the mint envelope and accents, but it could also be paired with any other color. 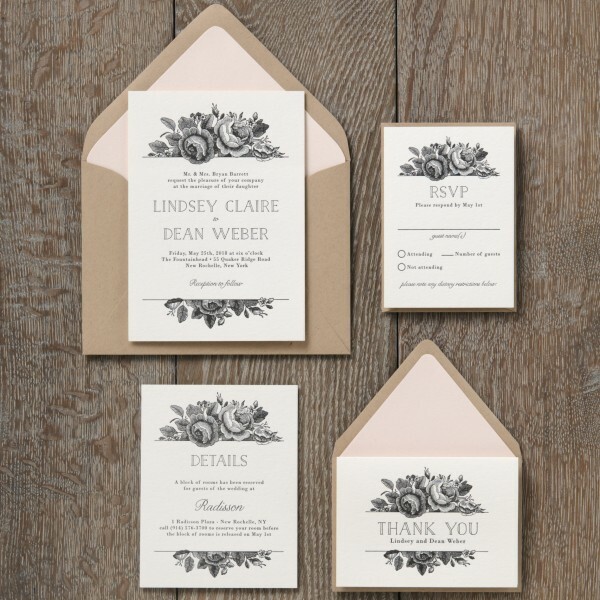 Which of our original wedding invitation suites are your favorite? Tell us in the comments below, and check out our Pinterest board for more invitation inspiration. Photo booths are one of the most popular party trends – and for good reason, too! They’re interactive, fun and make for great keepsakes. We’ve come up with two great D.I.Y. options for popular summer events. To start, you’ll need roll wrap (we used solid wrapping paper, but patterns would be fun, too!) to use as the background. To create our sets, we pinned the paper to a cork board we had in the office, but you can also attach the paper to a ceiling or wall with heavy duty tape. Don’t wait for the holidays to get into gift wrap! Birthdays, anniversaries, graduations…every celebration needs the perfect gift to accompany it! But as we all know, it’s all about presentation. No one wants to receive a gift that looks like it just arrived in the mail hours before the party! One of the best parts about receiving gifts is examining the beautiful wrapping the gifts are encased in. 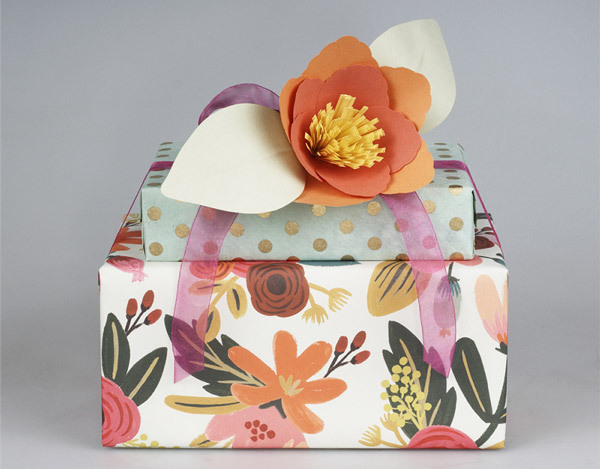 Paper Source has a variety of unique gift wrap for all occasions to give your gifts a perfect extra amount of style! Let’s talk about a few issues many of us face when wrapping multiple gifts. How do you signify that although your gifts may be different sizes, they are all extremely meaningful? One way to spice up the presentation of many gifts is to have each gift wrapped in their own paper, and all brought together by the tie of a ribbon! This post is brought to you by Rebecca B., who creates our workshops. 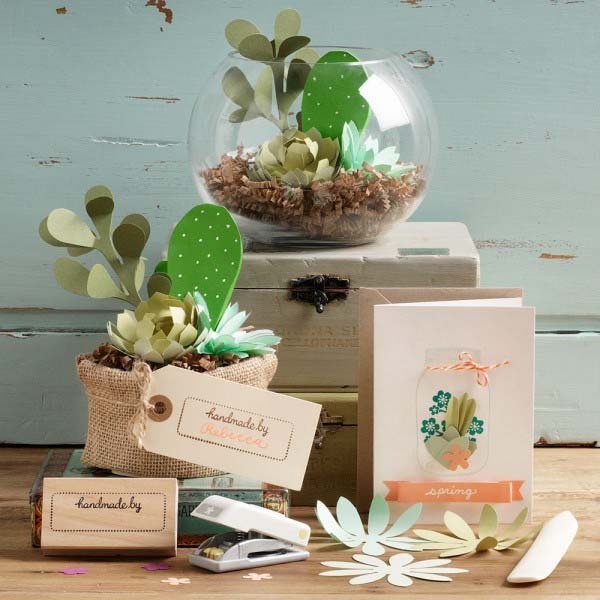 Here she tells you how she found the inspiration for our newest workshop, Mini Succulent Garden, happening Saturday, May 10.